Have to keep discovering new places, I keep telling myself, so where do Co. and I end up for our first 2010 foray into Paris and beyond? Back to a sure thing, Les Magnolias, the Jean Chauvel gem in the beyond of Le Perreux-sur-Marne. What more to say that I haven’t already said about this Michelin restaurant, other than that Monsieur Chauvel keeps experimenting and modifying the mysterious and unexpected carte—for example, Cabillaud rôti au four au “Moromi 3 ans d’âge” laqué de sesame noir soufflé (main dish) and Macaron rougi de “Grenade – Campari” et cassante Opaline scintillante ganache au chocolat lacté (dessert, wow). Ferran Adrià of El Bulli in Spain, the consensus pick for most famous restaurant in the world, must take a two year vacation (2012-13) to figure out how to upgrade his menu. M. Chauvel just keeps on keeping on. 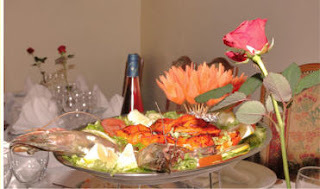 Sticking to the sticks, our second stop in January happened to be a couple Paris suburbs over from Le Perreux in Rosny-sous-Bois, where we returned for the 30th or 40th time to our favorite Indian restaurant in the Paris metropolitan area, Shalimar. But first some background. Welcome to Rosny – otherwise known as the gastronomic wasteland to the east. Just a short, 16-minute ride on the RER E from Gare du Nord and one short block walking from the Rosny-sous-Bois train station, Shalimar is a pearl in the wasteland. For a rapidly-growing, multicultural suburb of Paris (pop. nearing 50,000), where one finds a populace ranging from gleaners rifling through the trash bins at after-hours Fran Prix to high-powered plumbers, ingénues, and Paris Opera dancers, there is not a gourmet restaurant in site. Oh, you have your oddly named “Pro Evolution Snack” spot and assorted pizzerias and Turkish sandwich shops, along with the eminently avoidable El Rancho Tex-mex facsimile at the Rosny 2 commercial center, but the closest to anything gastronomic would have to be Monteuil’s Villa 9 Trois (which we found disappointing in the early days and never went back) and the aforementioned Les Magnolias. Which brings us to the ever-popular and always packed (at least on weekends) Shalimar. 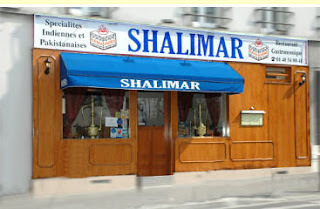 What’s so great about Shalimar? Well, it’s not that the food is exceptionally creative, gourmand, or original - it is just plain excellent (Tandori and curry specialties) and, oh yeah, the prices can’t be beat. Need I say more? Probably not, but as usual, I will anyway. 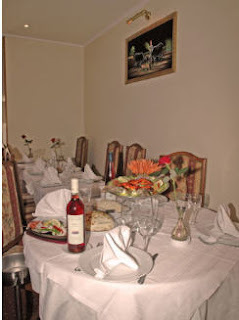 Once seated in one of the two relatively small, but comfortable rooms (seating for 50), after a warm greeting by the Pakistani owner, an aperatif (rosé kir) is offered, along with a pampadon. You can find the full, never-changing (my one main gripe) carte online at the restaurant’s website, so I’ll just focus on my favorites. For an entrée, there are two exceptional hits here, the cailles tandoori (two succulent Cornish hens accompanied by tomatoes, cucumbers, lemon, and some lettuce, 8€) and the gambas tandoori (one of the costliest items on the menu, but well worth it for a couple mammoth-sized, extremely tasty shrimp, 17€). Either entrée, accompanied by dessert, would essentially sate a moderate appetite. Glutton that I am, I typically follow up the entrée with a fish dish, and my current favorite is the Machi Shaslik, a copious, grilled plate of chunks of tandoori fish with generous amounts of thinly diced red and green peppers that arrives at the table still sizzling. Not quite spicy enough for my taste, the owner obliges my predilection for 5-alarm hotness and often slips a spicy plate of curry sauce as a go-with. The sauce is impeccable – it’s slow-building fire doesn’t overwhelm the taste of the fish, only enhances it. A side order of raita (yogurt and cucumbers, 4€) provides a nice counterbalance, along with a plate of palak paneer (Indian cheese cooked with curried spinach, 8€) or dal tadka (lentils, 7€). Co. typically opts for a lamb dish, of which there are ten possibilities to select from. Sandwiched in-between the pampadon and the entrée is the Indian bread, if one goes that route, and what other route is there? At Shalimar, I highly recommend the stuffed paratha, accompanied by a small tray with bowls of Indian pickles, mint sauce, and a sweet mango chutney. The stuffed paratha (3.50€) is a flat, lightly fried bread about the size of a small pizza, stuffed with ground vegetables. All told, our typical bill usually runs around 60-65€ for two – one cailles dish, two main plates, two side orders, Indian bread, and a bottle of wine. Try to beat that. As much as I’ve desired to finish off a meal at Shalimar with dessert (the Shalimar halwah has caught my eye), it has never been possible, even for a glutton like your’s truly. One day, perhaps. Nonetheless, as regular customers, it is nice to know that a cognac (for me) and mango lassi (for Co.) will accompany l’addition. 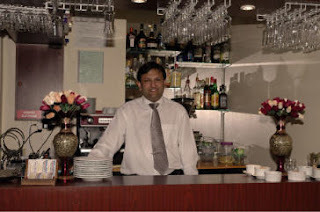 Treat your customers well and they will come back – voila, Shalimar’s secret for success. Note: It would be unfair to write off other possible stopping points for food in Rosny, however few they may be. I can recommend the more than serviceable Moroccan restaurant just a couple doors from Shalimar, Le Maroc (17, rue du Général Leclerc, tel. 0148 94 71 07), which serves up some very nice tagines at user-friendly prices. And there is a Japanese venue in the center of town scheduled for opening in a couple weeks. Sign of better days to come for foodies in Rosny?